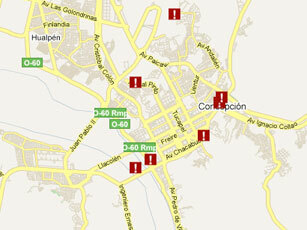 The Ushahidi-Chile project map on March 2. The Ushahidi crisis mapping site, which recently collated information from Haitian earthquake victims, has set up a sister site to aggregate similar data from Chile, a country recovering from a devastating 8.8-magnitude quake. Ushahidi-Chile collects, filters and then maps information submitted by citizens via email, text message and Twitter feeds. This Ushahidi project is coordinated by students at Columbia University‘s School of International and Public Affairs (SIPA) and its goal is to guide the relief effort and identify immediate needs. An advantage of the site, she says, is that it combines individual nuggets of information in one place and can help establish an overview of the situation on the ground. Messages currently on the site include information on medical emergencies, trapped survivors and structural damage. For example, from Santa Cruz: “No Electricity, Buildings Down in Santa Cruz”. Another message from Santiago reads “Plz Help: im stuck under a building with my child”. According to Ayala Iacucci, information on missing people is passed on to Google’s Missing Person Finder site. “Our major source of information is from Twitter feeds, the web and from monitoring local media,” said Ayala Iacucci, adding that there is still reasonable access to the internet in Chile. In Haiti, by contrast, most information that Ushahidi received was by text message. Around 50 student volunteers at SIPA – many of them from Latin America – translate the collected information and then input the data onto the interactive map. Ushahidi means “testimony” in Swahili and was initially founded in early 2008 to monitor and map post-election violence in Kenya. To send Ushahidi information about the aftermath of Chile’s earthquake: International text message +44 7624802524/e-mail chile@ushahidi.com/Twitter #chile or #terremotochile. Information can also be submitted via the web. Listen to an audio interview with freelance journalist Annie Murphy in Concepción.